The County Council hosted its first Town Hall Meeting of 2018 on Tuesday, February 20th. The topic was the Fiscal Year 2019 County Budget process. In accordance with the County Charter, the Council will receive the proposed FY 2019 spending plan from the County Executive by March 15th. Committed to an open, inclusive, and participatory budget process, the Council hosted its Town Hall Meeting to enhance public understanding of the process, and ensure informed public engagement with government as consideration of the FY 2019 spending plan for the County moves forward. The Council’s Health, Education, and Human Services Committee (HEHS) held an oversight briefing with Family Crisis Center, Inc. leadership to discuss the nonprofit’s FY 17 Domestic Violence Grant and the 60-day plan to address concerns at the center which services the needs of residents impacted by domestic violence. HEHS also considered legislation. The Council’s Planning, Zoning and Economic Development (PZED) committee reviewed legislation. Due to this week’s tragic event that took the life of fallen hero Corporal Mujahid Ramzziddin, the Council’s Public Safety & Fiscal Management (PSFM) committee meeting scheduled for February 22, was cancelled. Agenda items will be considered on the next PSFM meeting. The Council’s Transportation Housing and the Environment (THE) committee meeting this week featured a briefing from the County’s Department of Public Works and Transportation on pedestrian safety, the launch of Capital Bike Share, and funding for sidewalks and road resurfacing. PSFM also reviewed legislation concerning renewable energy. 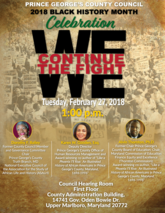 The Prince George’s County Council will host “We Continue the Fight,” in celebration of Black History Month 2018, on Tuesday, February 27th at 1:00 p.m. in the Council Hearing Room, First Floor, County Administration Building, 14741 Governor Oden Bowie Drive, in Upper Marlboro. “We Continue the Fight” will explore the historical struggles of African-Americans in the areas of education, employment, housing and politics, and ways communities are mobilizing to continue the fight for racial equality from both a national and local perspective. Featured guest speakers include former Council Chair, and Executive Council Member of the Association for the Study of African Life and History, The Honorable Dorothy F. Bailey; Prince George’s County Office of Human Resources Management Deputy Director and author, Karen W. Gooden, Esq. ; and former Chair of the Prince George's County Board of Education, Chair of the Maryland Commission of Education Finance Equity and Excellence (The Thornton Commission), Alvin Thornton, Ph.D. Ms. Gooden and Dr. Thornton are award-winning co-authors of Like a Phoenix I’ll Rise: An Illustrated History of African Americans in Prince George’s County, Maryland, 1696-1996. This event is free and the public is invited. 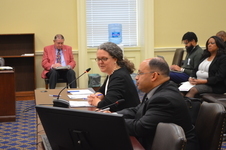 Council Chair Dannielle Glaros and Vice-Chair Todd Turner, who also chairs the Council’s Rules and General Assembly committee, and the Transportation, Housing and the Environment committee, addressed the County’s 2018 Legislative Priorities Friday morning in Annapolis. Council leadership discussed the priority concerns and needs of County residents with the Delegation, as they require the partnership of the County and the State to move forward. 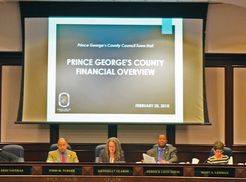 The Council presented several Proclamations on Tuesday, to organizations across Prince George’s County. Included among those honored were the Community Crisis Services, Inc. and many churches in the County for their participation in the Warm Nights Program. The County’s two homeless day shelters, the Prince George’s Plaza Day Center and Mission of Love Charities, Inc.’s new Day Center were also celebrated for their service to the community. The Council recognized the Coalition for African-Americans in the Performing Arts for exemplary contributions to the County and celebrated residents Solange S. Muller, 2018 Miss Prince George’s County Outstanding Teen, and Desna Johnson, 2018 Miss Prince George’s County.